Pink Ribbons, Inc. is a feature documentary that shows how the devastating reality of breast cancer, which marketing experts have labeled a “dream cause,” has been hijacked by a shiny, pink story of success. The film recently celebrated its World Premiere at TIFF, where it was named one of the TOP 10 Films. It opens in Canadian theatres on February 3, 2012. Making an Eco sexual Stink about Komen’s ‘Promise Me’ Perfume. Breast cancer is the boogey man lurking underneath our breastbones, and organizations committed to eradicating the disease are the super heroines wearing pink capes, except when they are selling something that can cause cancer. Scientists, Physicians and Oncologists criticize The Economist’s inaccurate coverage of cellphone and wireless risks and call for a retraction. Sign the Petition from Breast Cancer Action Montreal (BCAM) calling on Canada to require recognizable symbols on all products that contain cancer-causing chemicals. New! 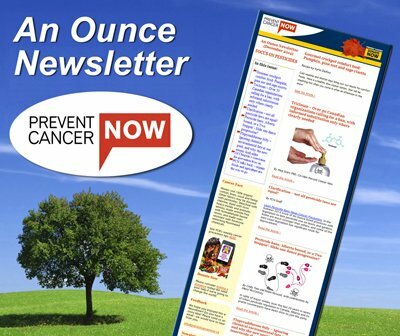 PCN Primer on Cancer Prevention. Looking for a quick primer on cancer prevention? When we give our multi-media presentation, Prevention Is The Cure, we provide this new handout for the attendees. Follow the simple instructions shown and you can print it up, staple it if you want, and keep it handy around your home or office as an easy reference. You might even roll it up for a useful stocking stuffer gift at Christmas time! U.K. cancer research organization provides useful tool to help prevent cancer. Can cancer be prevented? Decades of research have shown that a person’s chances of getting cancer depends on a mishmash of their genes and their environment, but also certain aspects of their lives, many of which they can control. Check out this great new tool.